An electrode and electrolyte combination developed by Qichao Hu’s SolidEnergy has the potential to improve battery cost-efficiency enough to make electric cars competitive with conventional ones. One key to SolidEnergy’s battery strategy is the use of high-energy lithium-metal electrodes instead of the graphite ones currently in use in lithium-ion batteries. The lithium-metal electrodes which are used in some specialty batteries now require the use of solid polymers instead of liquid electrolytes to prevent short circuits. The polymers are poor conductors of lithium ions and must be heated to high temperatures to work properly, creating inefficiencies. Hu has solved that problem by coating his lithium-metal electrodes with a thin layer of special polymer using a conventional process and using a non-flammable ionic liquid for the electrolyte. By eliminating the potential for fires, and the various costly measures used to prevent them, SolidEnergy’s solution cuts dramatically the cost of the materials used to make battery packs and improves their energy efficiency and reduce cost, according to Hu. He figures that his materials would cost $130 per kilowatt-hour, much less than the estimated $250 to $500 per kilowatt hour for packs in current commercial use. If Hu’s calculation is correct, his innovation would bring the cost of electric vehicles in line with the affordability target set by the Department of Energy. Hu was an MIT graduate student working in the lab of renowned MIT professor Donald Sadoway when he developed a polymer ionic liquid (PIL) rechargeable lithium metal battery that can operate at room temperature. The feat helped him win the Department of Energy’s 2012 National Clean Energy Business Plan Competition. He was also named to the Forbes list of 30 most important innovators under 30. Confident that his PIL batteries can be made to be safer, smaller and hold twice as much energy as conventional lithium ion batteries, Hu co-founded SolidEnergy and is serving as its chief technology officer. In its first round of venture funding SolidEnergy raised $4.5 million. It has already built small batteries that can store 30% more energy than conventional lithium-ion batteries. Hu believes he can achieve a 40% improvement. He sped up the process of developing a working battery by making use of the facilities and expertise of a Boston-area lab of A123 Systems, a firm bought out of bankruptcy by China’s Wanxiang. The first commercial application of SolidEnergy’s battery technology will likely be for portable electronics like mobile phones. Smaller batteries can be developed within a few years while batteries for electric cars be far more durable and take much longer to develop. 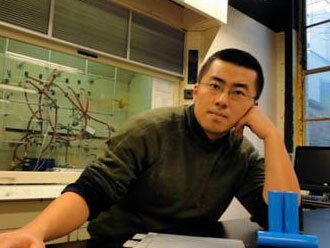 Qichao Hu was an MIT graduate student when he discovered an efficient new electrode-electrolyte formulation that became the basis for SolidEnergy.